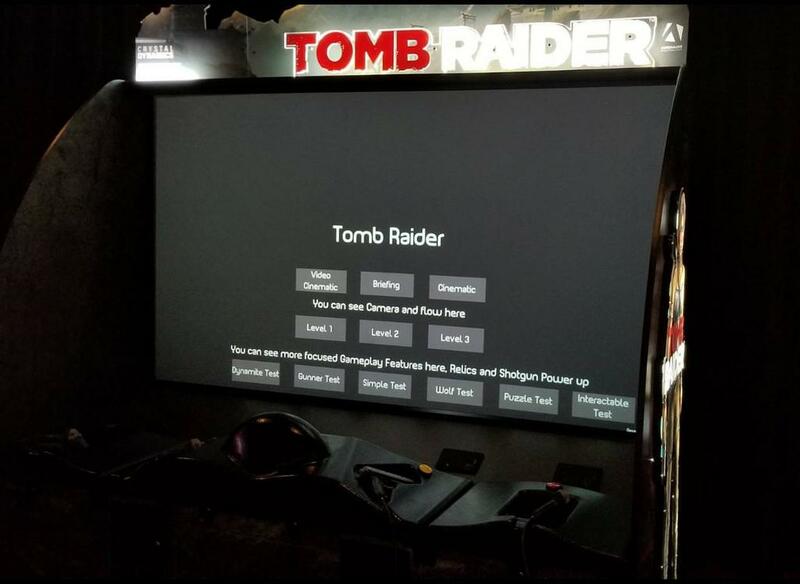 UPDATE: Dave & Busters officially rolls out Tomb Raider Arcade. Click here for details. Last year right before IAAPA 2017, we found out that Canadian based game maker Adrenaline Amusements was working on not one but two different video arcade games involving Ubisoft’s Rabbids – Rabbids Hollywood and Rabbids Ticket Fiesta. When I got some hands-on time with both games at the show, I was surprised to see that Hollywood was a straight up video arcade game without any ticket dispensers. It is also notable for it’s 120″ screen and support for 4 players at once, a rarity among arcade light-gun type games. After checking their website, it has been updated to show that the game is now shipping out to interested arcades & venues out there while Rabbids Ticket Fiesta has been delayed until March. I did try and reach out to Adrenaline for comment on this a couple of weeks ago but did not hear back. UPDATE: Thanks to Jordan on Twitter for providing this more professional (albeit with heavy JPG artifacts) cabinet image of Tomb Raider. The image on the screen looks to have been cut and paste from the newer TR game…or it could be one of the cinematics as it is unusual for a light-gun shooter to be in 3rd person. 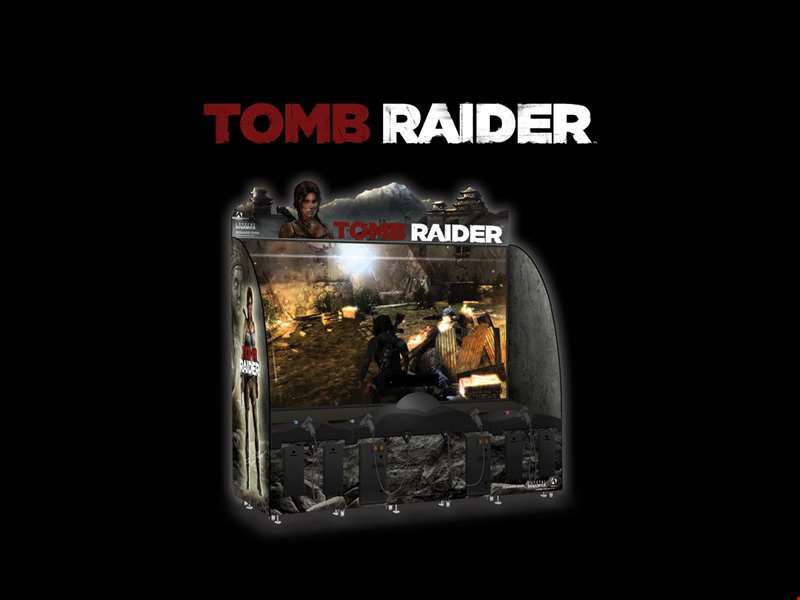 The marquee as seen in the initial images below also appears to be incomplete as Lara Croft also belongs up top; likely they will add that piece once the software is unlocked. Interesting that this image shows standard coin doors as opposed to typical card readers that D&B uses…maybe there’s a slight chance this is a timed exclusive for D&B. 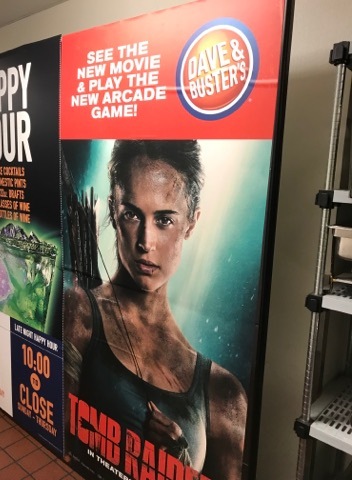 Original Post: A bigger surprise also came along a few weeks ago when I heard that Dave & Busters was getting a “variation of Rabbids Hollywood” based on the popular Tomb Raider series of video games. The game would reportedly begin shipping out to certain, unspecified locations within a “couple of weeks.” I reached out to both Dave & Busters and Adrenaline for comment but there was none to share; so we rely on internet sleuths to notice when said game shows up unannounced. The game has because showing up at certain Dave & Busters locations this week although we do not know at the moment whether or not all D&B locations will be receiving the game. 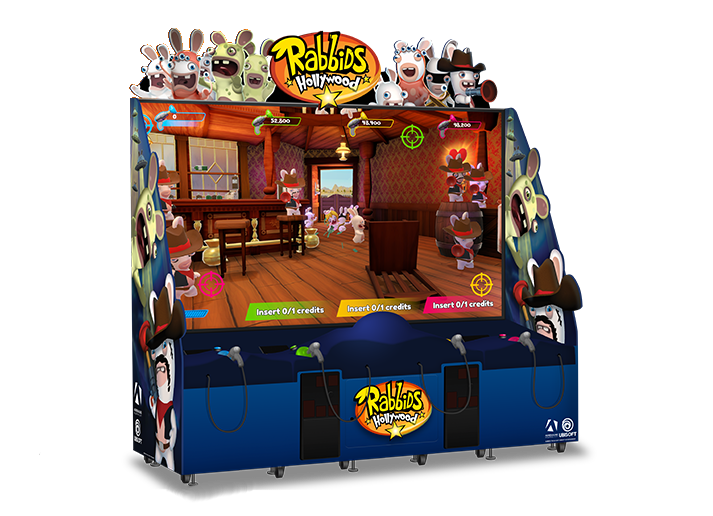 This uses the same cabinet as Rabbids Hollywood (4-players at once, 120″ HD screen) as seen above, with the artwork, marquee and pistols changed to fit with the new game. UPDATE: Here’s another photo found on the Tomb Raider Forums. This is odd as it shows the game flow from when you start with the cinematics and such. It also shows that like Rabbids Hollywood, it has three levels. By this you can notice the Crystal Dynamics and Square Enix logos on the left. Between that and the text/art of the marquee, this appears to be based on the video game that Square Enix released back in 2013/14 but modified in some way to be more of an action shooting game than a platform hopping, exploration action game. I would venture to guess that the pistols use a similar technology to Rabbids Hollywood, which appeared to be internal gyroscope sensors as opposed to your typical IR LED net placed around the marquee. If you have a Dave & Busters near you and are interested in this game, I imagine that it should be playable by this weekend at various locations. Unfortunately we don’t have any further details on this one yet but we will certainly update this post once more is known. 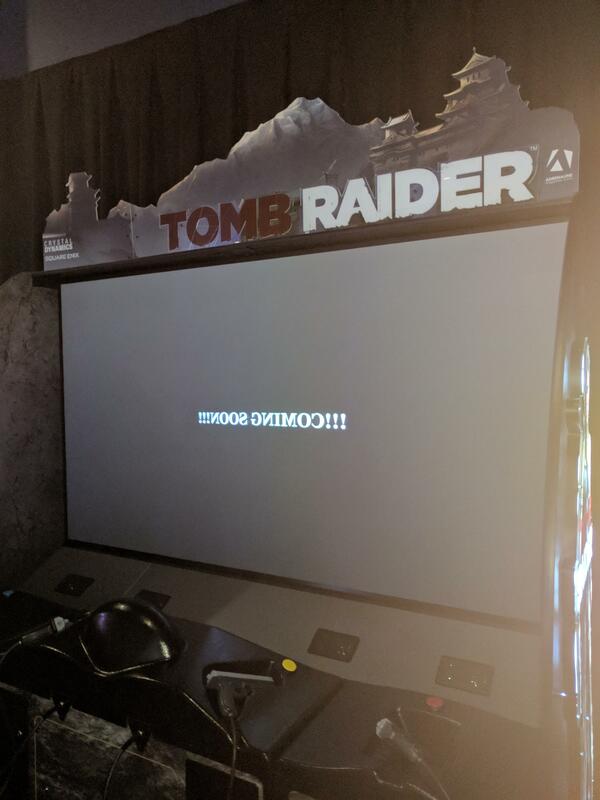 I don’t know if I can handle Tomb Raider taking the genre change like it’s doing to suit “current era” arcades. I’ve been a pretty big fan of this franchise for being what it is throughout the years and to me it reeks of being nothing more then a cash run attraction then attempting to bring back a part of something the industry has wiped out for years. On console platforms, we already have another twist on TR being an overhead shooter that supports 2-4 players and is in many ways similar to other twin stick shooters before it. If the arcade business can support Nex Machima, then trying to turn this into something it’s not isn’t going to work. I hope developers/publishers more then analysts (@#$% them! Seriously) start getting brave enough to take risks again, cause genre diversity has become a real lacking benefit that so many of us sorely need to see again. As for this game, I’ll wait and see until we can see it in action but I did hear that Spider-Man Homecoming wasn’t very good…very curious to see how this one has turned out. Yeah I wasn’t at all impressed with what I’ve seen with that Spider-man app trying to pretend it was an actual game, not to mention it was the same feeling I had when Injustice wasn’t anything we’d have hoped it should have been. I do get that this industry isn’t the same as it was over 15 years ago and everyone in the business has to do whatever they can to make ends meet, but sometimes I can’t help but ask if they have an understanding on what direction they’re really trying to go in terms of what’s going to be beneficial (for us) in the long term? It’s still that same situation where Japan still gets all the good stuff, yet we have to put up with the crap we have as nobody’s putting a plan together that re-targets the audiences who have been forced to abandon the hobby. I keep thinking we have barcades and they’re neither big enough, nor is anyone making great titles for that area to develop any sort of player/competitive scene that’s going to bring us back from the slump. There’s Killer Queen with it’s limited number of areas, then someone made a joke called The Last Barfighter, which is only good for the cabinet art when maybe the home versions of Mortal Kombat, Killer Instinct, Street Fighter, Injustice, etc could have been re-coded for arcade use instead? I know I’ve been through this before, but we really do need to get things back on the right track somehow. We’re in our 40’s and believe it or not, we still want good arcade titles again. Not kiddie crap for the tourists. Both D&B and Round1 are supposed to open this Spring (D&B at the Gateway as you mention, Round 1 at South Towne mall). I’ve heard that construction for D&B has started but I haven’t been to either of those malls in a while to verify. I played Rabbids Hollywood in the UK today (16 Feb 2018)! In fact, I think we spotted an arcade staff member actually setting it up and testing it! This was at Clarance Pier in Southsea.